Hosted in Louisville, Kentucky, NTOA 2016 turned out to be a great show and conference. Local and federal agencies in attendance included officers and operators from corrections, Military Teams, SWAT and other Specialty Units. From Chiefs to Sergeants all that attended were presented with 6 days packed with activities, opportunities, and seminars on subjects such as: Ethical Leadership Under Fire, Contemporary Tactical Policing in a Post-Ferguson Era, Terrorism Tactics Against Law Enforcement, and many more. The annual Awards Ceremony and Dinner Banquet featured keynote speaker Major Dan Rooney. The training schedule was also full of courses for officers to participate. The training scheduled ranged from live fire tactical handgun and carbine courses, active shooter response and even mass shooting debriefs. All that attended gave stellar reviews to the NTOA and guest instructors. SBTactical shared a booth with our Florida dealer Central Florida Tactical Solutions. 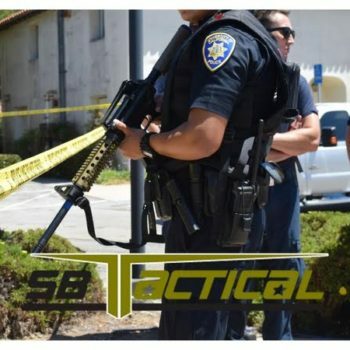 We received amazing feedback as tactical officers were blown away by the stressX technology and training opportunities offered by using iCOMBAT in their training regiment. The stressx belt provides immediate feedback using shock to induce stress during training. It also provided plenty of entertainment for those willing to try it at our booth. The NTOA team did an amazing job incorporating the host city of Louisville, Kentucky. Woodford Reserve distillery a happy hour in the vendor area serving Old Fashioneds Kentucky-style. NTOA also provided mini Louisville slugger baseball bats and the city itself welcomed all the attendees with open arms. Galt House hotel was an amazing host that left no stone un-turned. The vendor’s floor was full and offered attendees the opportunity to view and test new products. We can’t wait for next year’s NTOA 2017 conference which will be held in Phoenix, AZ.